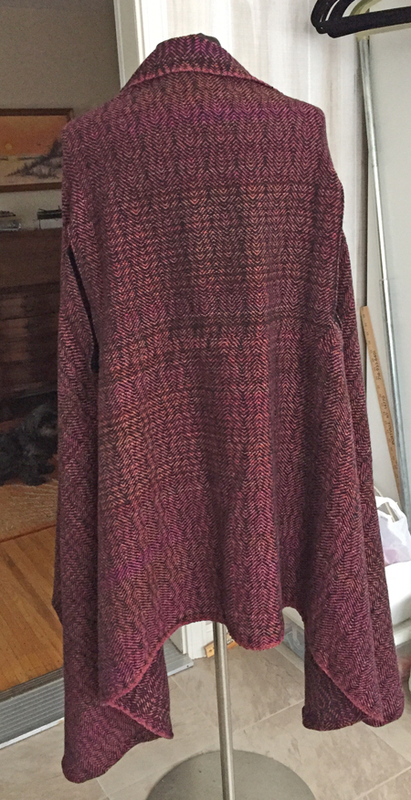 Handwoven (November/December 2014) calls this a circle shawl. Another weaver who makes something similar calls hers cloaks. I don’t know what to call mine. UPDATE: My ever-brilliant daughter tells me that they are commonly called open front cardigans these days. That’s what I’ll call mine! I used the directions in Handwoven only somewhat. I didn’t use their warping or weaving directions at all, modified the dimensions in their sewing directions, and added a lining to the armhole. And I’ll make more modifications next time. I wish I’d been bolder with the colors, but there’s time enough to change that. I’m sure I will make more of these, whatever they’re called, for my summer show(s). My daughter, who’s quite fashion-conscious, gave the thumbs up on the design. Yay! Now for my question. I’m hoping that at least one of my readers will have some input for me. I’ve been very busy so far this year – helping to paint the interior of a home, spending time with family & friends, and lately spending many hours shoveling. So I am VERY behind on meeting my monthly weaving goals. Now I know that my garments, things that have both more fabric and more hand work involved, will sell for more than a flat piece of fabric that’s a scarf or shawl, so I’ll need fewer total items, but still…I need to have a certain amount of inventory to set up a booth at a show. I’d really like to apply to both of my good summer shows, one in July, one in August. But I can’t yet know if I can realistically produce enough for both shows. If I end up with not enough inventory, or sell way more than I anticipate at the July show, and have to back out of the August show again, will I be black balled? Or do shows expect a certain number of artists to back out each year? Nice Peg! The design pattern really shows nicely on your shot of the back. I don’t know about being back balled but I would ask about cancellation and if you can hold back a third of goods from the July show that might suffice or, go in with another weaver or fiber artist for the booth in the August show…. OK – Here’s the deal on capes/cloaks. A cape is a sort of rounded item which goes over the shoulders and covers the back and comes around to the front over the arms. It may or may not have closures on the fronts. Cloaks start out the same as capes. but then there is additional fabric involved. 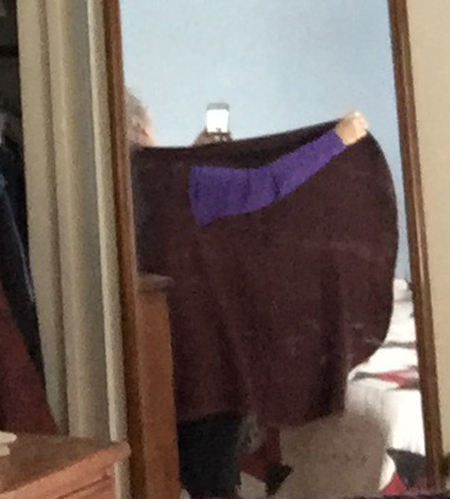 The piece that goes around the back goes around the front over the arms. BUT there is additional flat fabric which goes down the front from neck to hem. The cloak I know best is divided into two pieces and closed with hooks and eyes down the front. That cloak has a military type collar (mandarin?) that all other fabric flowed from, and also closed with hooks and eyes. The front pieces are attached to the back at the shoulders and at from about the waist down. It is open in between, though, so that the arms go through between the front panels and the back cape-y part. Your cloak/open cardi is wonderful. 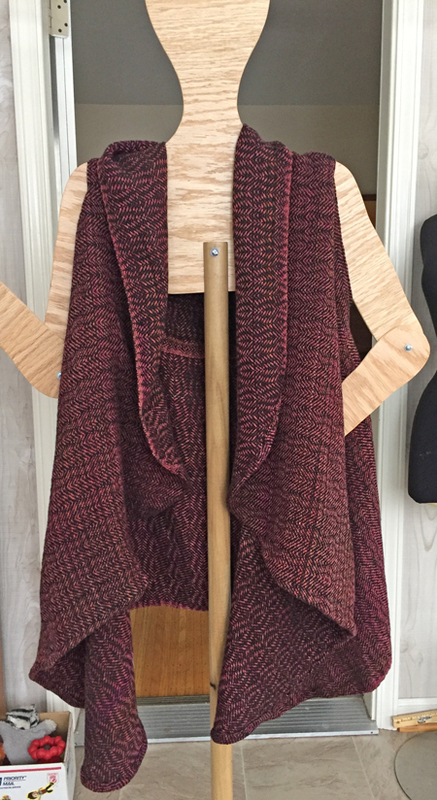 I remember a guild member making one of these years ago, I think it was also in an old Handwoven – I loved it and vowed I’d make myself one…..still haven’t done it, maybe yours will inspire me to make myself one to wear by next winter. Hard to know about what will happen if you have to cancel out on the show again. I wonder if you could contact someone there to ask about it. Are there some quick makes you could add to your booth so you’ll have more items to sell? I’ve sold tons of ice dyed scarves and shawls over the years in addition to my handwovens, they’re quick makes which means you’ll have more in your booth and they’re less costly so might attract buyers who can’t afford the handwovens.